Should I vaccinate my Angora Goats against Rift Valley Fever (RVF)? One thing is for sure is that we will get an outbreak of RVF again in the karoo……….the unknown part is just when? One hopes not again on our watch! Due to the extent of the outbreak during 2010-11 it is very likely that most of our Angora goats would have been naturally exposed to the virus and so became naturally ‘vaccinated’. Over the following years however, our ‘vaccinated’ Angora ewe flocks would have been largely replaced by maiden ewes joining each year and the older ewes being culled. As the proportion of immune goats declines (now 6 years after the last outbreak) in our flocks, the possibility of an outbreak will increase if the rainfall conditions trigger an explosion of vector numbers in late summer. We can learn from the past outbreaks to try to help us look into the future. From the graph, it also becomes evident that after a large epidemic, such as the ones experienced during 1950–1951 and 1973–1976, outbreaks continue to occur for several years after the epidemic when conditions favoured the vectors (mosquitoes). This would suggest that we need to aware that it is still possible to have more outbreaks over the next few years if we get excessively high rainfall patterns over the later summer months. Studies in Africa indicated that the RVF virus activity was more likely after cumulative rainfall, rather than heavy precipitation over a short period. 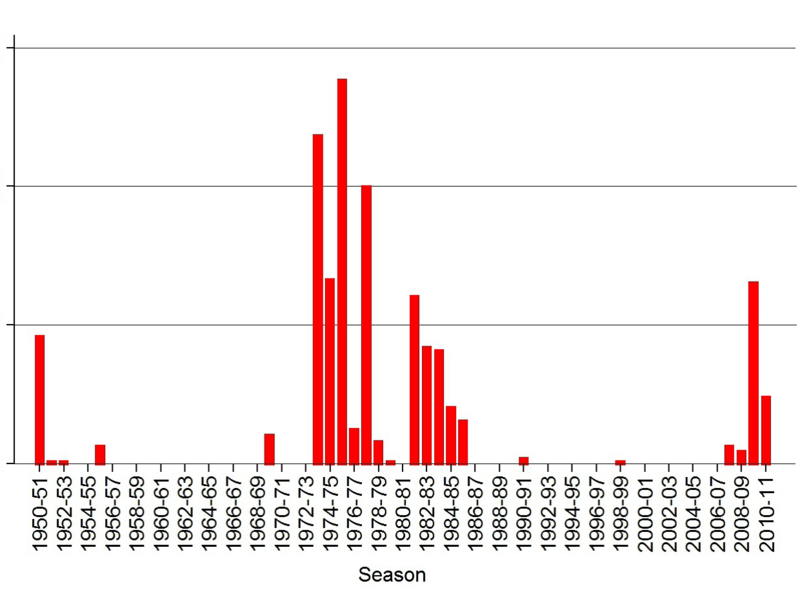 Where outbreaks occurred before January, this often followed outbreaks late during the previous season. We should be vaccinating our Angora ewe flocks. If, as a farmer, you are reluctant to vaccinate your Angora goats then I would suggest you at least vaccinate just your maiden ewes as a once off each year (with the live attenuated RVF vaccine) as they enter your ewe flock and again if above average rainfall occurs. Repeating the vaccine will likely stimulate a better immune response than a single vaccination. Vaccinating at the time of an outbreak with the live RVF vaccine is NOT recommended and may exasperate the situation as a reversion to virulence is a possibility as may have occurred in 2010-11. Only a ‘dead’ vaccine should be used during an outbreak. What happens to the virus between outbreaks? Trans-ovarial transmission in certain mosquitoes may occur (Aedes spp) (Linthicum et al. 1985; Pepin et al. 2010). The eggs lay dormant on the edges of pans and hatch when conditions of high rainfall occur. However, the three major epidemics were associated with a different RVF virus lineage (Grobbelaar et al. 2011), indicating that long-term survival of the virus in dormant mosquito eggs is unlikely to have been the main mechanism for virus survival between these epidemics. Another possibility is the low-level circulation of the virus between animals and mosquitoes, without resulting in clinical signs or severe outbreaks (Pepin et al. 2010). Serological evidence of low-level circulation of RVF virus in African buffalo has been found in the Kruger National Park and antibodies have been found in several wildlife species. On the positive side, Angora goats are thought to be slightly less severely affected than sheep. The disease can be classified into 4 grades depending on severity. Kid deaths occur within 12 hours after the fever reaction starts, others may survive longer and die within 12-24 hrs. 10-60% of kids older than 2 weeks may die. Fever, increased respiratory rate, nasal and eye discharge may occur. Abdominal pain and reluctant to move. 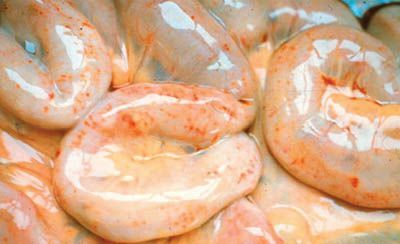 Haemorrhages occur throughout the carcass, notable on the intestine. Haemorrhage from the nose may occur. 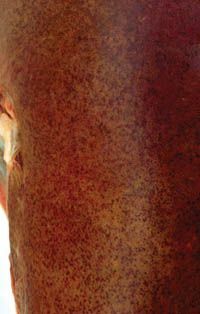 Liver enlargement, swollen with rounded edges and necrosis. 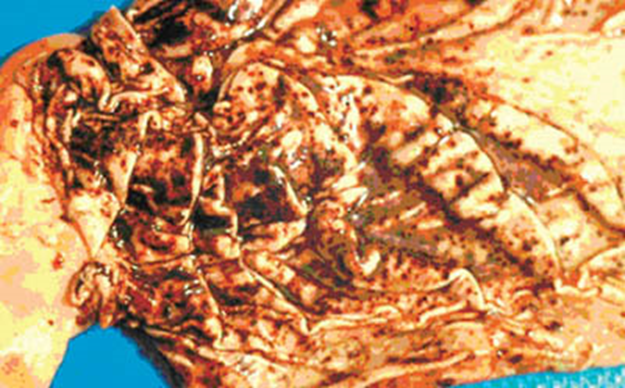 Liver congestion, later a bronze to yellow colour. The necrotic changes to the liver induce jaundice . Haemorrhages especially on the surfaces of the body cavities, and on the heart, gall bladder, kidneys, bladder and other organs. Bloodstained ascitic fluid may occur.. 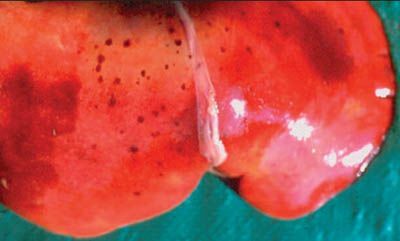 The lungs may be congested with oedema and emphysema and subpleural haemorrhages are commonly found. The heart will show subepicardial and endocardial haemorrhages. There is a generalised lymphadenopathy involving the superficial and visceral lymph nodes. These are oedematous with petechial haemorrhages.